Having a few days off, with nothing to do, has resulted in me getting the photos I have to process organized. A lot of the photos I’ve released from my last trip to the Victoria Falls were taken under tricky conditions. I was surrounded by swirling mist which soaked both me and my equipment and obscured my view of the falls, making everything blurry and flat. I got clear shots the first time I was there, but there wasn’t much water about. 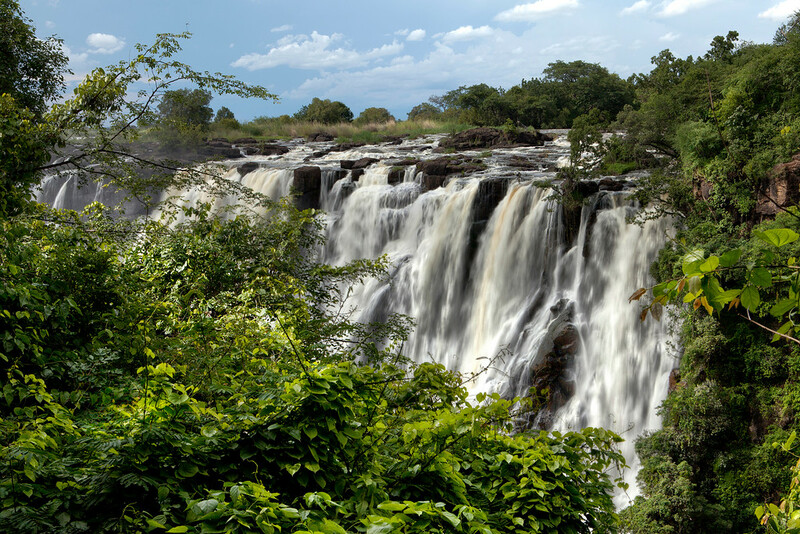 This picture, is actually of the first view of the falls you see when you enter from the Zambian side, but it was the last picture I took that day. Apparently, I’d figured out how to deal with the mist by this point. I think I’d gotten more patient, waiting for the mist to clear before clicking the shutter. Looking at the shots I took just before this one, I think I’ve got some more clear images to come. 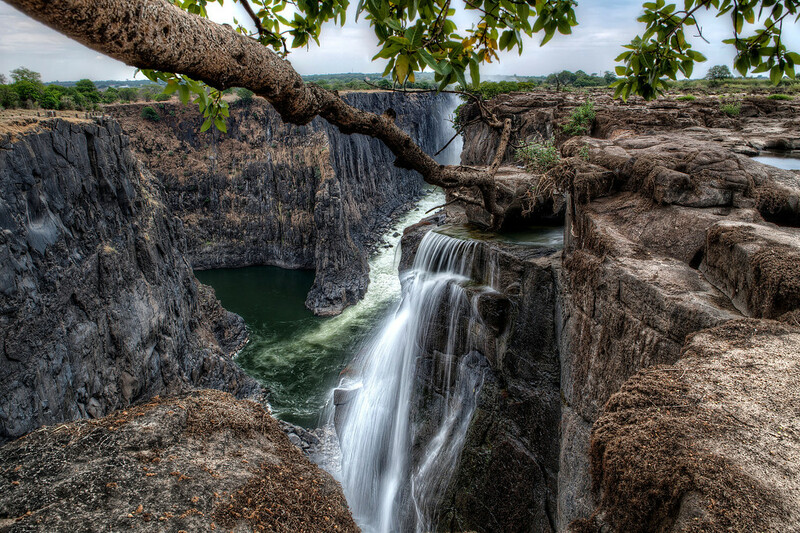 Ah, Victoria Falls… I may be seeing you again soon. I just hope I can get over this bloody flu before flying out in two days!!! I’m planning on making my way back here in January. I can’t wait to see the cliff to the left, and actually the very spot where I was standing to take this picture, inundated by flowing and tumbling white water. 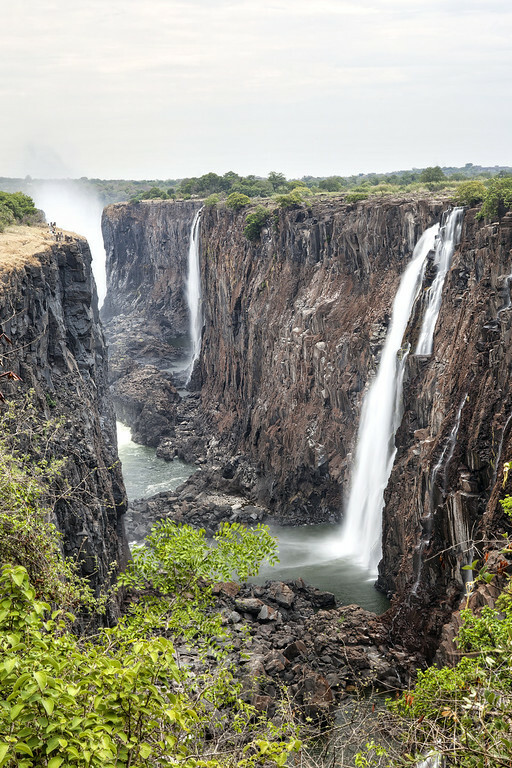 The Victoria Falls during the dry season was an incredible experience. 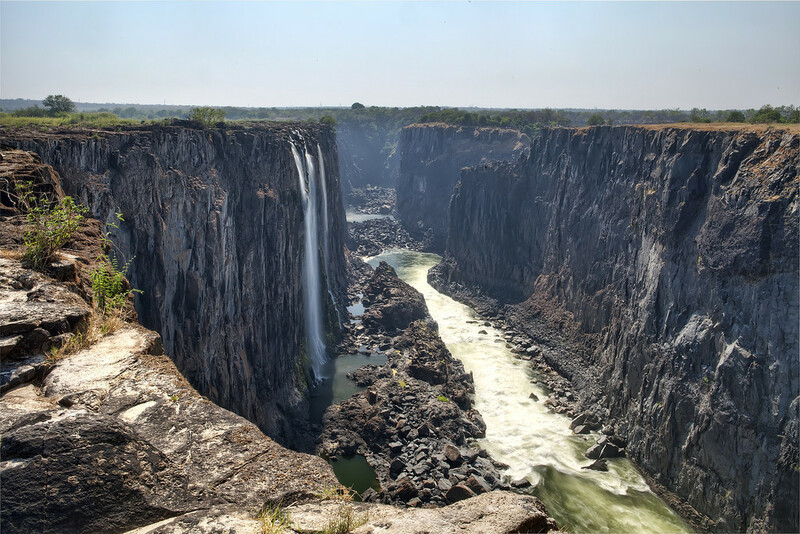 The gorge ripped open by the force of the Zambezi was clearly on display. 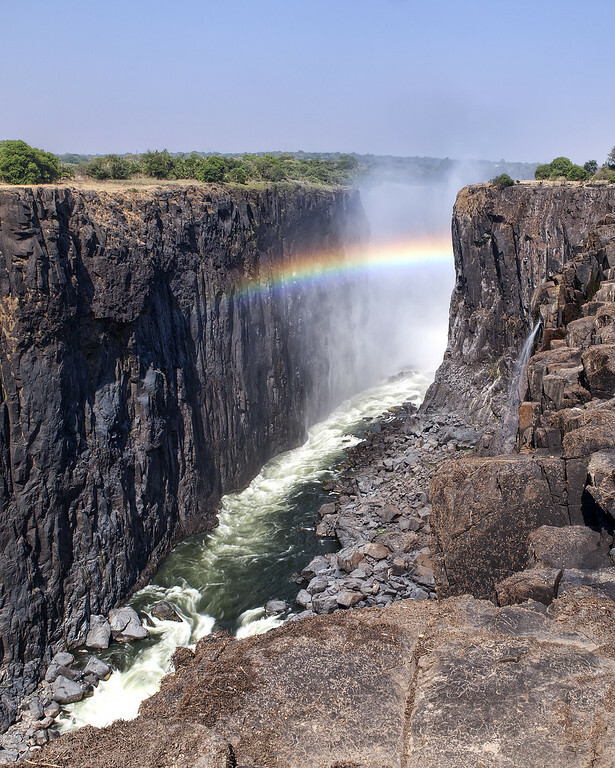 We were able to walk across the top of the falls to swim in the Devil’s Pool and hang our heads over the edge, and I was able to take this photo of the rainbow born of the spray from the torrent just around the corner. I enjoyed my time there so much that I’m planning on going back in January. This will give me the chance to experience the full power of the falls as it will be during the wet season. I’m also hoping to coordinate my visit with the full moon in the hope that I’ll get to see the lunar rainbow. Our junior guide, who typically stayed at the back of the group paddled up ahead and caught up to our main guide. Then, they made for the shore. It was about lunchtime and I thought that was why we were stopping. Instead, we were told to stay in our canoes and just beach them slightly. 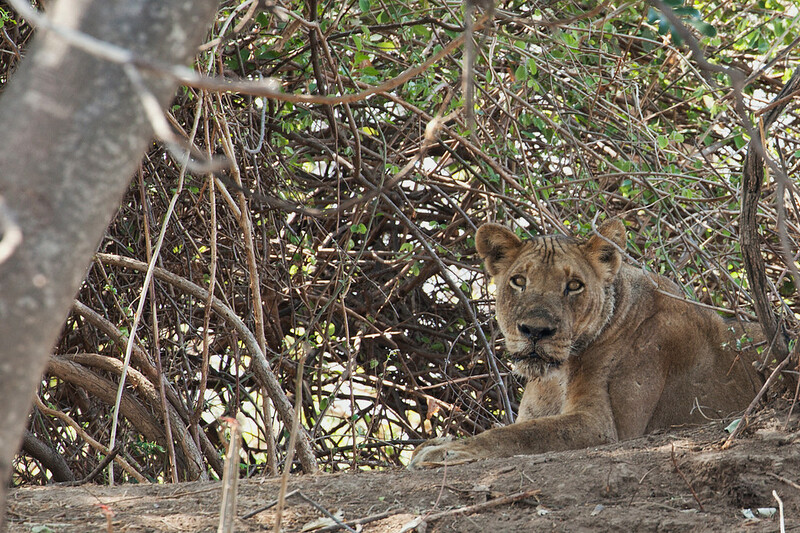 Then, we saw her, camouflaged extremely well amongst the brush, a lone lion, just 30 meters away. We sat and watched her for a while as she sat and watched us, very casually. She’s an old lion, we were told, and had likely had to leave her pack and attempt to fend for herself. She seemed tired and had a sadness in her eyes, that I think you can see here. After pushing off and continuing down stream our guide praised his assistant for spotting her and confessed it was a good thing as he’d planned on stopping there for our lunch break! Taking the Photo: I zoomed in far as I could and made sure that I set the focus on the lioness’ eyes as she gazed back at us. I was shooting handheld as I was sitting in a canoe at the time. I shot three bracketed images but chose not to use them. Processing: I decided not to use the bracketed images as there was too much movement in the scene, from the lion to all of the foliage around her. I tried creating an HDR image by adjusting the exposure levels in Adobe RAW, but realized that I preferred the single exposure to the output from Photomatix so just adjusted contrast in Photoshop and bumped up the detail in Topaz Adjust. I had to make a substantial crop in order to zoom in further on the lion. As the 5d mk II uses a full frame sensor this was possible without the resulting photo being too small. I’ve decided to stick with my rule of not posting photos from the same country two days in a row (I know I’ve broken it in the past), but I’m desperate to work up some of my Iceland photos. I expect I’ll be up late tonight doing just that. On top of that I was in the middle of redesigning the site when I had to take a break to travel to Iceland. I really want to make a little more progress on that tonight. For those of you patiently waiting for my tutorial, I did make a lot of progress before leaving. I find I work best on the weekends when I can really dedicate a lot of time to it. I’ll be putting in some more effort this weekend. 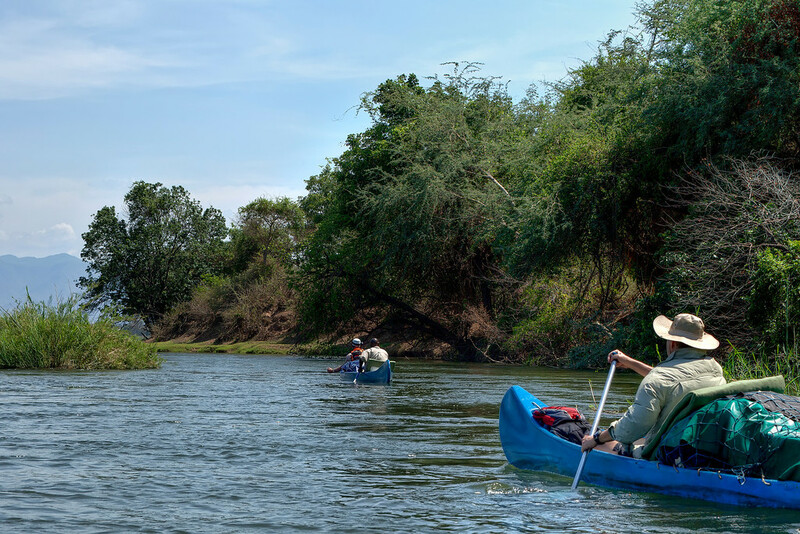 Canoeing down the Lower Zambezi makes use of the old cliché “the journey is half the fun” really come into its own. Drifting casually down the river (while carefully keeping your limbs in the canoe) is punctuated by moments of intense activity and excitement. A lot of the time this is brought on by hippos hanging about in the shallows. The problem posed here is that when hippos get scared they head for deep water. So, if you’re in between the hippos and the deep water, you’ve got a problem. As a result, the approach is simply a bold game of chicken, in which you steer straight at the hippos in an effort to move them into the deep. Other exciting moments resulted from elephants coming down to the water to drink and play, which Chris and I may or may not have gotten dangerously close to. Other times the excitement was that we had an opportunity to get out of the canoes, whether it was to eat lunch, make camp, or go for a swim in a “safe” stretch of river. I say “safe” because, when asked, our guide said we were safe from crocodiles in the shallow water because we could fight off a crocodile there. Now, I don’t know about you, but in my opinion, if I’m having to fight off a crocodile I am already in serious trouble! This photo was taken at one of the calmer moments as we floated through a narrow channel of the river. I’ve changed my approach to photos with moving subjects. Rather than trying to combine three different exposures I’m working with one RAW. Using Photoshop’s RAW converter I create three images by adjusting the exposure of the original. Then I combine these three images using Photomatix. This way, I don’t have to deal with loads of ghosting issues. If you look through my gorilla photos by clicking the category to the right, the last few have employed this method and you should be able to see an improvement over my earlier attempts. I wrote about this experience previously, here. 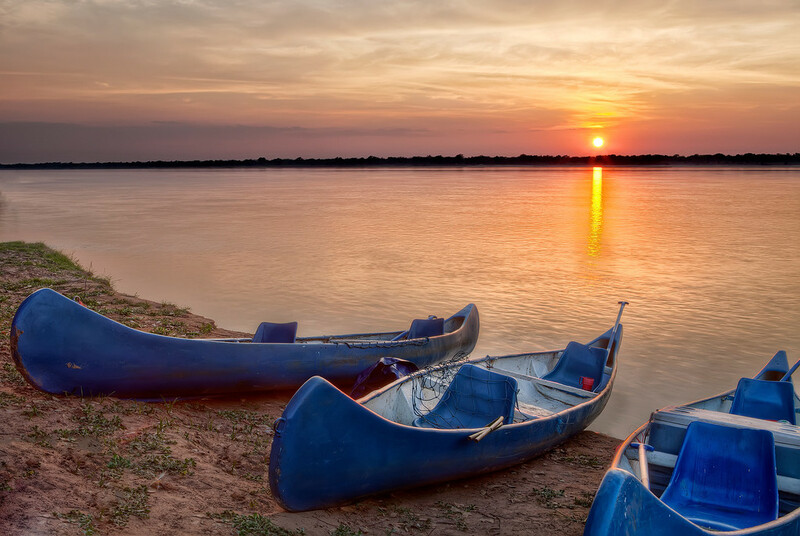 We’d pulled our canoes up to an island in the middle of the Lower Zambezi. I thought we were there for a closer look at these elephants and started firing away. When I turned around I realized that our guides were setting up for lunch. We sat and ate lunch with these giant animals no distance away. They didn’t seem to be bothered by our presence. After about half an hour they walked to the other side of the island where they splashed into water and swimming off down the river, trunks raised like snorkels. I had the pleasure of using a few of these shower contraptions while traveling through Bolivia and Peru. They use electricity to heat the water… in the shower head. Bare wires are not uncommon. I thought they looked a bit questionable but didn’t give them a second thought, I was typically desperate for a shower. None of the shower heads actually shocked me, though a few friends of mine got zapped. I did get a pretty nasty shock off of a light switch hanging from my ceiling with bare wires on the back though. This is an interesting little article on suicide showers with a bit of advice in how to go about showering safely when faced with them: How to Survive a Suicide Shower. My first night sleeping on the Zambezi I had the opportunity to take this photo. I was still pretty creeped out standing next to the water at this point. Images of a crocodile leaping from the dark waters kept running through my head. As a result, I kept a safe distance away. This was actually ridiculous, when you consider that I had no idea what a safe distance was. I like today’s image because I feel like it portrays that feeling of not knowing what’s beneath the surface. the darkness of the water preventing you from knowing if anything is there. I also like the texture on the surface of the water created by the wind blowing across it. 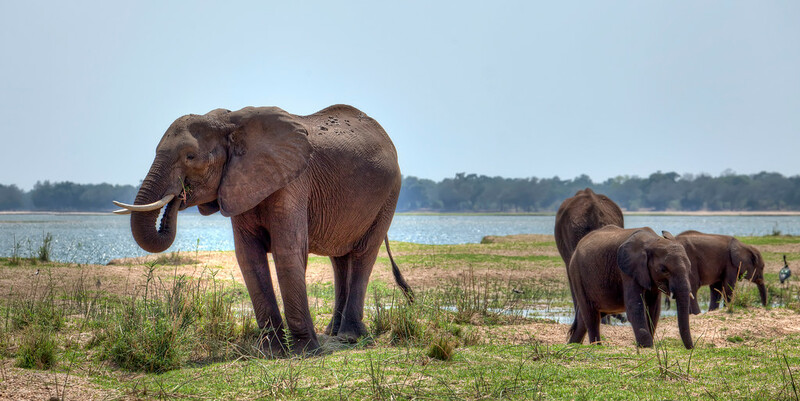 You stand in Zambia, on the shore of the broad Zambezi, gazing towards Zimbabwe from Zambia. 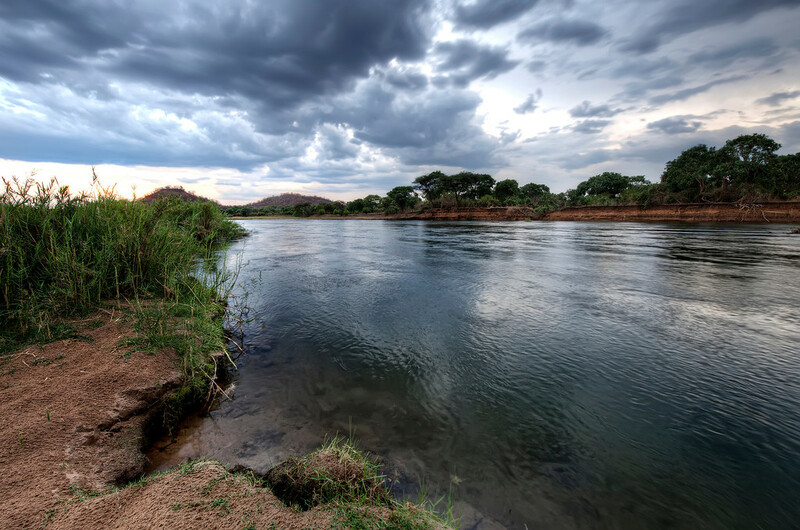 It’s surprising you can feel so energized after a night being woken by such noisy neighbors – elephants trumpeting on the salt lick behind camp and lions rumbling across the river. They’re far away but sound as if they’re knocking on your tent flap. As the flaming sun slowly emerges from below the horizon, lighting the smooth flowing waters in front of you, the peace is shattered by the grunting of a nearby hippo. Your canoes are ready to go, but they’ll have to wait a little longer as the smell of breakfast, bacon and scrambled eggs, wafts to your nostrils. After eating your fill the Zambezi will continue to provide surprise after surprise, bend after bend. It’s going to be a good day. If you fancy waking up to this scene, you can buy a print here. On my gear page I mention that I’m not fully satisfied with my current tripod and mentioned one set of legs I’m considering. I’m going to be expanding this section soon because the more I look round the more options I find. I’ve got a good idea of what I want. The legs max height needs to be about 5’3″. At this height, the tripod head plus the height of my camera should get the viewfinder to eye level for me. It also needs to be able to set up with the legs spread out flat so I can shoot from ground level. With this in mind I don’t want a center column, as they reduce stability when extended and make getting the camera to ground level difficult. With setup in mind, one thing I like about my Benro Angel is the twist locks on the legs. So, that’s something I’ll definitely be looking for in my replacement. Additionally, I want to go as light as possible so will be looking at buying carbon fiber. These parameters are pretty easy to fulfill, but I also want it to fit in a carry on. This is where things get tricky. Hopefully, I’ll find something suitable soon as I want to bring it to Iceland with me in June. After crawling out on a ledge for the photo posted here, I set up in a much safer position on the other side of the tree. I still can’t believe how unrestricted we were at the top of the falls. This day Shannon and I had gone back to the falls without a guide and just walked right along the edge in search of photos. We did have one scary moment though. On the way back to the parking lot, I’m pretty sure we encountered the biggest baboon in the world. It was terrifying and grunting. It definitely did not sound like it was in a good mood. We backed off and hid behind a bush as it crossed the path and disappeared.